Imagine taking a tour that began on August 27 and ended on November 6. For those who were lucky enough to afford it, that is exactly one of the tours described in Daily Itineraries of Special European Parties (1892) by E. M. Jenkins. These tours gave some the opportunity to travel across Europe visiting important landmarks and historic sites to learn about history, art, music, and other cultures. E. M. Jenkins, New York, NY. 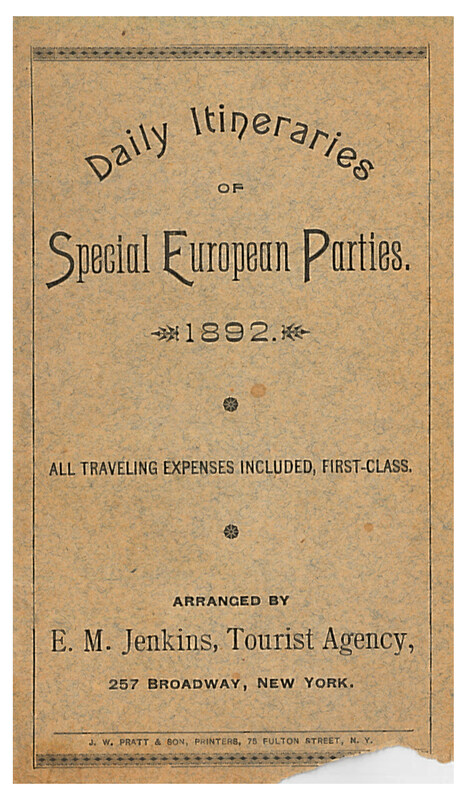 Daily Itineraries of Special European Parties, 1892, front cover. The Tourist Agency of E. M. Jenkins offered several tours of Europe for the year of 1892, as shown in the list below. The cost of each tour included travel expenses, hotel accommodations in first-class hotels, sightseeing and admission fees, carriage transfers, and baggage transport. Each tour was limited to no more than 25 people. E. M. Jenkins, New York, NY. 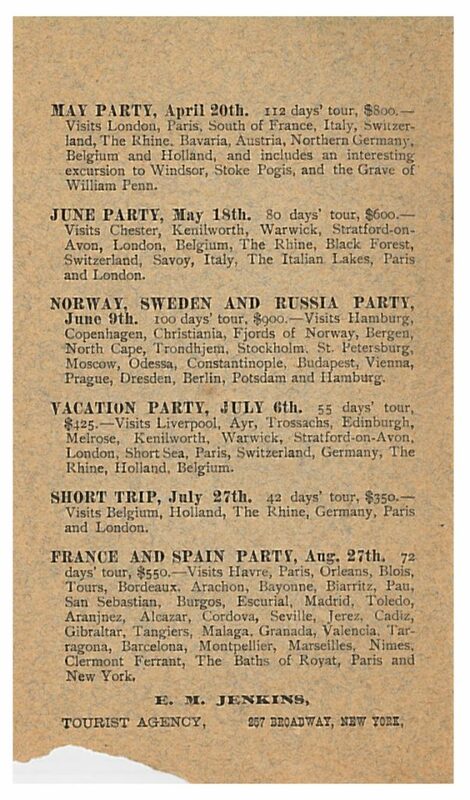 Daily Itineraries of Special European Parties, 1892, inside front cover, list of tours for 1892. 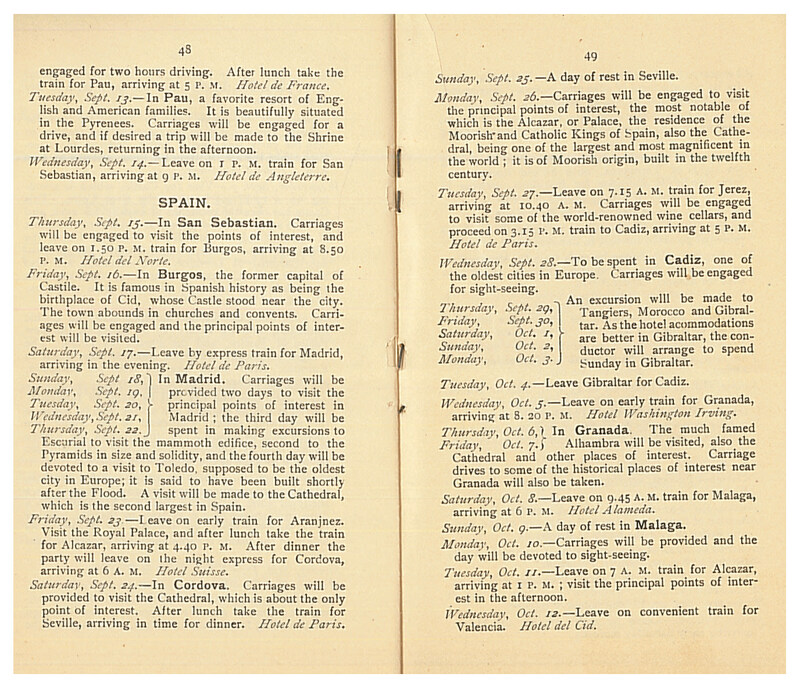 The “Fall Party to France and Spain” lasted 72 days. The party sailed via steamer from New York on Saturday August 27 and arrived in Le Havre on Sunday September 4. Later that same day, they traveled on to Paris for a short visit of about a day. They had a longer stay in Paris just before they set sail to return home almost two months later. Their tour of France included a visit to the Castle in Blois, an excursion to Chateau de Chambord, stops at the Cathedral of St. Andre and the theatre in Bordeaux, and, if desired, a trip to the Shrine at Lourdes. At dinner on each night of the tour, the conductor passed around a card to all participants. This card described the schedule and plan for the following day. It gave them the opportunity to read their guidebooks that evening to familiarize themselves with the sites they would visit the following day. By mid-September, the group traveled on to Spain spending about a month visiting palaces, cathedrals, wine cellars, and other landmarks. This included touring royal palaces, the Cathedral in Seville, the Alhambra in Granada, and sites in Burgos, Madrid, Barcelona, and other cities. The trip was not over yet! They returned to France for a few more days. In Nimes, they visited the amphitheater and Gothic Cathedral, and then before heading back to Paris, they enjoyed a day of rest in Clermont Ferrant. There, they had the opportunity to take a twenty minute drive to the baths at Royat. Then it was on to Paris for a few days of sightseeing before setting sail for New York on Saturday October 29. After many weeks away from home, their expected return date to the US was Sunday November 6. E. M. Jenkins, New York, NY. 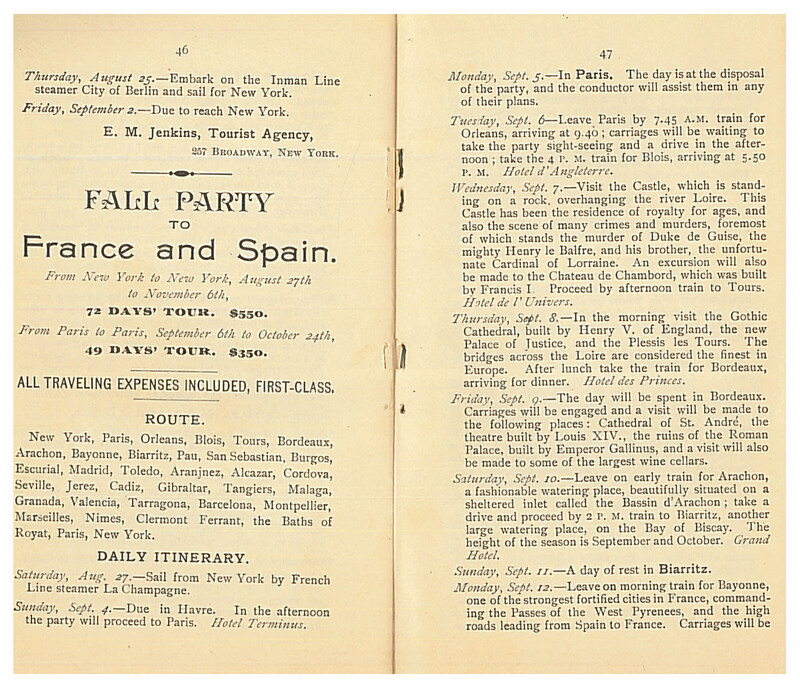 Daily Itineraries of Special European Parties, 1892, pages 50-51, Fall Party to France and Spain Itinerary for October 13 to November 6, 1892 and a list of guidebooks. 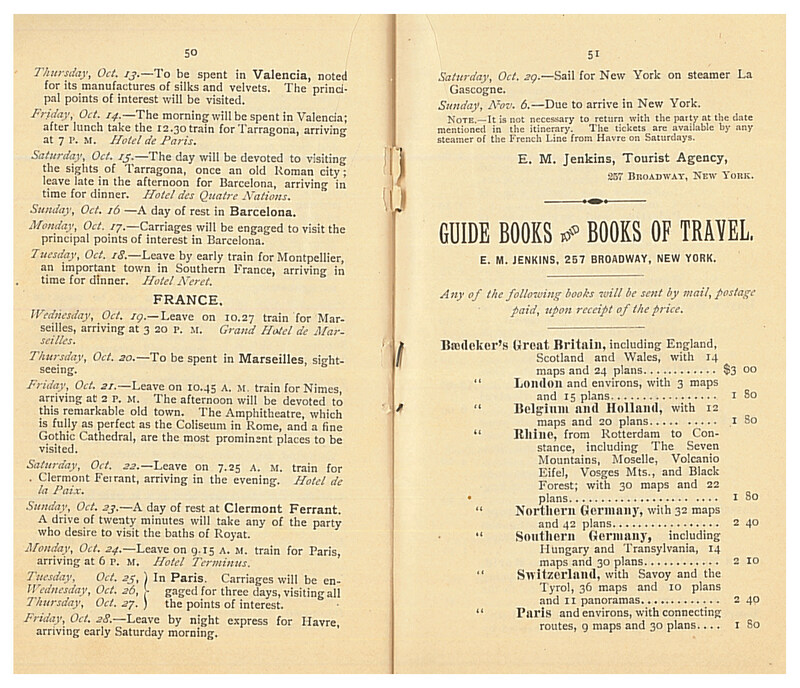 Daily Itineraries of Special European Parties (1892) by E. M. Jenkins is located in the Trade Literature Collection at the National Museum of American History Library. The Trade Literature Collection includes many more travel related catalogs including one about trips via the railway.